Inclusive teaching refers to a variety of teaching approaches that strive to address the needs of all students. Inclusive teaching provides a learning experience that allows students from all backgrounds, learning styles and abilities to be successful. Inclusive teaching strategies contribute to an inclusive learning environment in which all students feel equally valued. 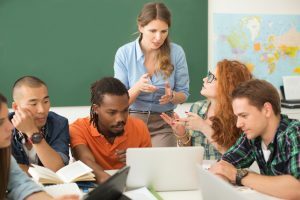 Inclusivity in the classroom implies that the classroom environment is one in which all students feel that their contributions and perspectives are equally valued and respected (Cal Poly). Establish ground rules for discussions with your students using a Libby Roderick “Start Talking” strategy that involves students in the development and implementation of the discussion rules. Provide opportunities for students to share their own experiences and perspectives. Students learn from each other and the various perspectives and existing knowledge their fellow students bring to the table. Activities such as a fishbowl activity or reverse circle discussion activity can encourage and direct these challenging conversations. Include content from multiple perspectives in the course. As much as possible provide content from diverse perspectives or created by individuals from differing backgrounds. Get to know your students. Invest time to focus on getting to know your students. The impact may surprise you. The simple gesture of addressing a student by their name demonstrates care and concern. You can do this through icebreakers [link to list of icebreakers in FYFTA and group activities.